A mother told San Diego Sheriff's deputies she fell sleep at the wheel and crashed into a Vista building Saturday morning, causing a gas leak. 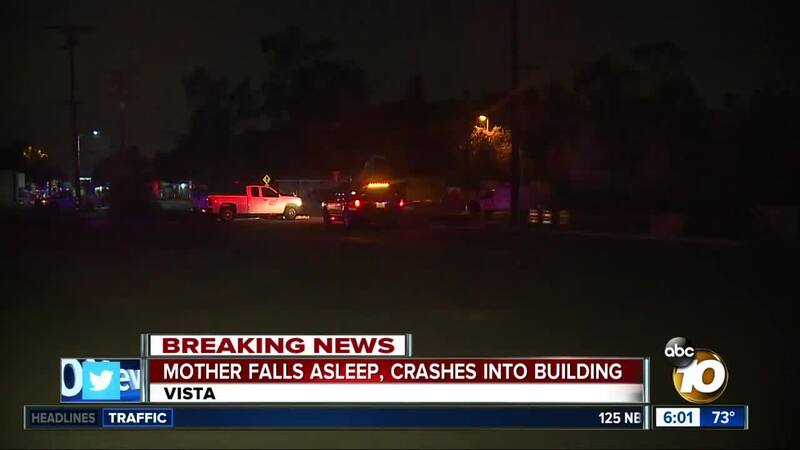 VISTA, Calif. (KGTV) — A pregnant mother who fell sleep at the wheel early Saturday morning crashed into a Vista building, causing an hours-long gas leak. San Diego Sheriff's deputies say the crash occurred at about 2:45 a.m. on South Santa Fe Ave., near Civic Center Dr., at a Battery World store. A family of five was in the SUV that crashed after the driver, identified as a 30-year-old pregnant mother by deputies, told deputies she fell asleep before she lost control of the vehicle, struck a telephone pole, and crashed into the building. A 40-year-old man, a 3-year-old boy, a 2-year-old boy, and a 9-month-old girl were in the SUV at the time of the crash. The driver sustained a bruise to her forehead. No one was seriously injured, deputies said. The family was taken to a nearby hospital as a precaution. The crash caused a gas leak in the damaged building. SDG&E crews have since fixed the leak. The utility company said the leak did not expose the neighborhood to dangerous levels of gas, but nearby residents were able to smell the gas. No one was inside the building at the time of the crash. S. Santa Fe Ave. was closed until at least 7 a.m.